The Rogers Chair of Studies in Journalism and New Information Technology reflects a commitment to interdisciplinary studies in media and information technology, with a base in the Faculty of Information and Media Studies at Western University. Support for the Chair is provided by an endowment from Rogers Communications Inc., announced in the summer of 1994, and from a long-standing commitment by the Office of the Secretary of State, Government of Canada. The first appointment to the Rogers Chair occurred in January 2000. Professor Nick Dyer-Witheford is serving as Rogers Chair between July 1, 2015 – June 30, 2017. 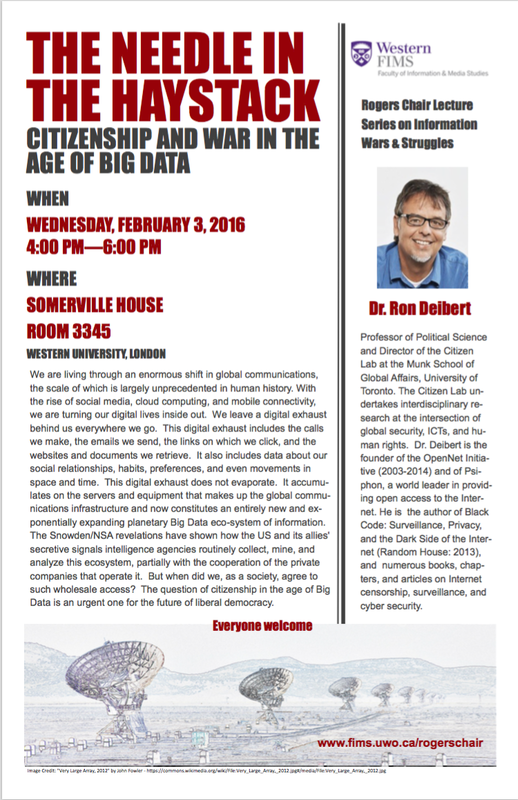 I’ve been working with Nick on organizing 2015-2016 lecture series. Andrei Soldatov (Russia) is an investigative journalist and editor and co-founder of Agentura.Ru, an information hub on intelligence agencies. Soldatov is a regular contributor on the topics of terrorism and intelligence for Vedomosti, Radio Free Europe and the BBC. He authored a chapter on Russia’s secret services in the PSI Handbook of Global Security and Intelligence: National Approaches. Irina Borogan (Russia) is an investigative journalist and a deputy editor of Agentura.Ru. She started her journalistic career in 1996 as a reporter at Segodnya newspaper. As reporter, she covered the NATO bombings in Serbia in 1999, hostage takings in Russia, 2006 Lebanon war and tensions in West Bank and Gaza Strip. Borogan regularly chronicled the increasing influence of the security services in the Russian government and investigated the Kremlin’s campaign to gain control of civil society under pretext of fighting extremism. 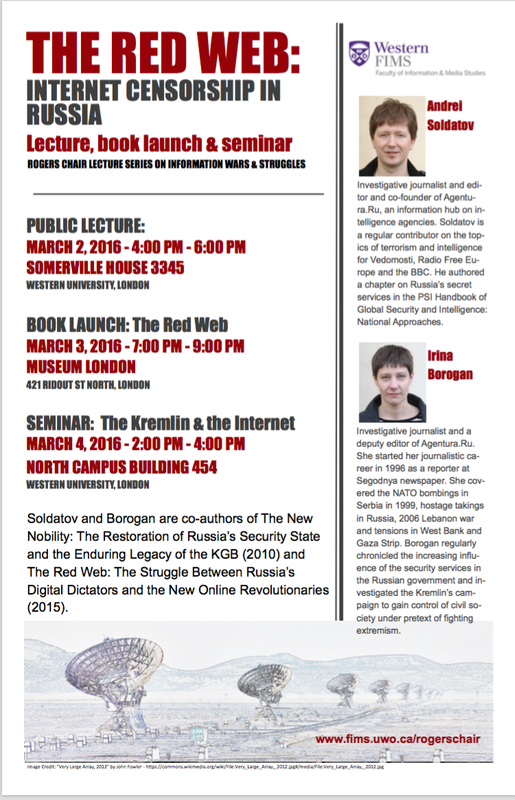 Soldatov and Borogan are co-authors of The New Nobility: The Restoration of Russia’s Security State and the Enduring Legacy of the KGB (2010) and The Red Web: The Struggle Between Russia’s Digital Dictators and the New Online Revolutionaries (2015). In 2003, Harun Farocki concluded his documentary War at a Distance by stating that current wars are no longer fought between the equals: rather, they are outsourced and exported to the already degraded, downbeat and devastated parts of the globe. In post-2008 era this formula needs to be revised, as zones of total impoverishment, permanent crisis and collapse of state sovereignties sprout into areas formerly known as ‘First’ and ‘Second’ worlds. While Russia is deeply entangled into the undeclared war in Ukraine, planting the post-sovereign militarized para-states in the East of Europe, France is declaring a war on an ephemeral and elusive entity that is Islamic State. It seems that the central figure of today’s warfare is a proxy gone rogue. Is the proxy war merely a continuation of proxy politics by other means? Oleksiy Radynski (Ukraine) a filmmaker and writer based in Kyiv. He is a participant of Visual Culture Research Center, an initiative for art, knowledge, and politics founded in Kyiv, 2008. His screenings and talks have recently taken place, among other venues, at Oberhausen International Film Festival, e-flux (New York), Museum of Modern Art (New York), Institute for Contemporary Arts (London), Academy of the Arts of the World (Cologne), and Volksbühne Theater (Berlin). Lyuba Knorozok (Ukraine) is a producer working in documentary film. Her film projects took part in competitions at Oberhausen IFF, Guanajuato IFF, T-Mobile Nowe Horyzonty IFF and others, and were screened at venues like the Institute for Contemporary Arts (London), e-flux (New York), Academy of the Arts of the World (Cologne) etc. Her recent films include Integration (2014) and People Who Came To Power(2015). She has recently produced projects for BBC World News and European Cultural Foundation. 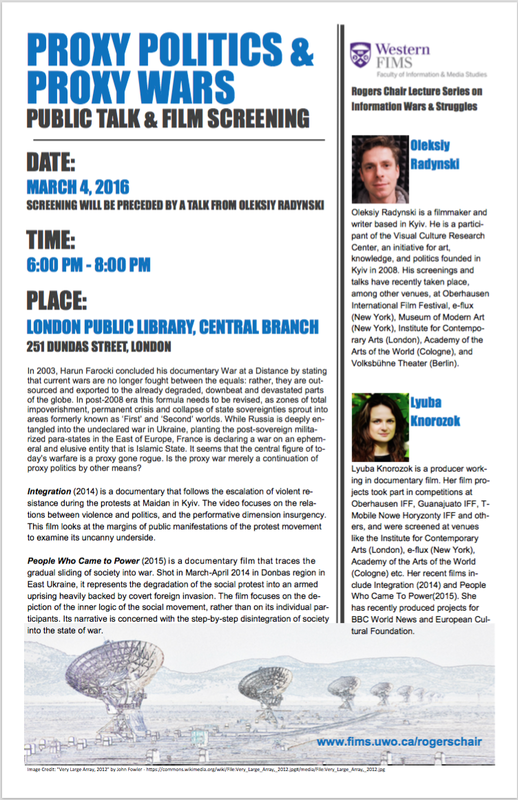 Integration (2014) is a documentary that follows the escalation of violent resistance during the protests at Maidan in Kyiv. The video focuses on the relations between violence and politics, and the performative dimension insurgency. This film looks at the margins of public manifestations of the protest movement to examine its uncanny underside. People Who Came to Power (2015) is a documentary film that traces the gradual sliding of society into war. Shot in March-April 2014 in Donbas region in East Ukraine, it represents the degradation of the social protest into an armed uprising heavily backed by covert foreign invasion. The film focuses on the depiction of the inner logic of the social movement, rather than on its individual participants. Its narrative is concerned with the step-by-step disintegration of society into the state of war.